Police investigate a shooting that left two people injured at a Minneapolis mall March 5, 2016, during an Air Jordan sneaker release. 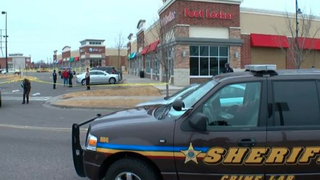 Two people were injured in a shooting near a Minneapolis Foot Locker Saturday while waiting for a chance to buy the limited-release Air Jordan 2 Retro Wing It sneakers. According to KARE 11, some men began arguing in the Brooklyn Center shopping center. That argument spilled out into the parking lot, where witnesses told the news station that “several shots” were fired. Police were already on the scene prior to the shooting, since the release of the sneaker, which retails for around $200, had caused several people to arrive at the mall early. After the shots rang out, cops found two people down with non-life-threatening injuries. Both victims were taken to a local hospital. Police interviewed several witnesses and are still investigating the incident, but no arrest has been made. Read more at KARE 11.